Lately I have been feeling the fatigue of watching too many mediocre movies. Not every film can be a gem, but it just seems like all I can pick out are films that leave me bored and empty inside. Nothing about them are particularly bad, nor is there anything magnificent. They just lay there waiting to waste two hours of my life. When I get this fatigued, I usually try watching a golden oldie, one that I know I loved with all my heart. But my boyfriend thought of a better idea. Instead of re watching what few movies I had, why not watch a fun cult movie that leans towards so bad its good territory? This time I think he was right. 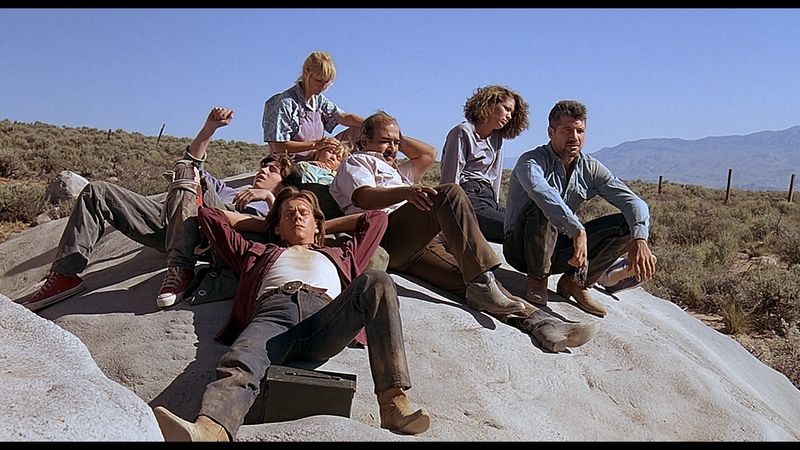 Tremors is an early nineties movie through and through. It has Kevin Bacon and Fred Ward in it as bumbling handymen in a small isolated town in the West. They are surrounded by dust and small town characters. They can’t wait to get out of it and go to the big city, Bixie. But a monster creature derails their expectations. Instead of escaping to the big city, they must defend their small town against the terror of Graboids, large worm like things that travel underground and respond to vibrations. Tremors is a light-hearted romp through a small town. Everything in the movie is a stereotype but they all play to its advantage. You have the two bumbling heroes, the ultra serious female love interest, the quirky shopkeeper, the gun-toting mad men, and the rascal children who are constantly asking for a beer. Kevin Bacon and Fred Ward take these stereotypes and riff on them in pleasant ways that make me laugh. In fact almost every character in this movie is laughable but that is also what makes you feel empathy for them. These lovable humans shouldn’t die at the hands of a large worm like creature. And I think the director agrees with me. He puts these characters in ridiculous situations where they are only armed with their wit and abilities to throw off one liners. The movie never takes itself too seriously and that is part of its appeal. Although the threat doesn’t seem like it would ever happen outside of a movie, the comedy is able to endear the characters to us and provides us with a way to feel empathy and sometimes horror at the other person.